Join the discussion on our forums! 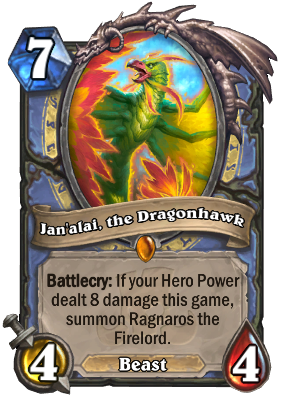 Come discuss Jan'alai, the Dragonhawk over in our dedicated Jan'alai, the Dragonhawk discussion topic. Has anyone had success with this and Khadgar? My deck uses zola to play 2. My deck uses Brann, Zola and Echo of Medivh to play and summon 6 Rags. Do you think this card will see play when Baku gets rotated out? I do not because it will be too slow. A Turn 5 activation will become Turn 9 instead (this is without the help from other cards). It means you have to rely on Fire-Eater and Spirit of the Dragonhawk. Funny how you mention turn 9. Cause now you can play this turn 9 and summon 2 rags. Theres a fancy 2 cost guy they printed to keep this bird flyin. Will you survive without a 2 cost 2 dmg ping til then? I bet you can. Khadgar is the 2 cost guy btw. I crafted it the first day expansion. I haven't regretted so far. I personally think this is by far the worst designed Loa out of all of them. Not for power level, it's a very strong card. But I feel like the card doesn't have an identity of its own. It's identity is that it Summons Ragnaros. Even what it says is basically "RAG TAKE THE WHEEL". It doesn't have its own flavour, just acts like a tick on Ragnaros's behind. Hmmm, Ragnaros is too strong for standard, we have to move it to Wild. Let's return it back with 7 mana cost and additional 4/4 body. Interaction of this card with Brann Bronzebeard causes disconnection for a bit. Modified Big Spell with Her and Zola. Been a lot of fun so far! This card is a real blast! Looks like her counter won't work when you attack minion with divine shield. Next time read it better. Where did you see ,,exactly 8 damage" in the card text. Star Aligner doesn't say "exactly 7 health", but that's still how it works. There's nothing showing how much damage your hero power has done in a game. Star Aligner you can track just by looking at board state. It won't surprise me if it's 8 exactly, but it would make more sense to be 8+. Wait a minute, by my understanding of the wording on the card, you gotta deal exactly 8 damage with the hero power for the effect work?? imo it seens like it. Otherwise it should say "dealt 8 or more", am I right?